Contact: Dr. Derrick L. Campbell, Ed.D. The Classroom Racism Exterminator unveils the Raccelerate Racism Formula and the Raccelerate Racism Scale. February 24, 2015 – (Blackwood, NJ) – The Classroom Racism Exterminator, a leader in eliminating classroom racism, today unveiled its Raccelerate Racism Formula to help schools determine where they fall on the Raccelerate Racism Scale. The Raccelerate Racism Formula and the Raccelerate Racism Scale are direct products of the Raccelerate Phenomenon. The Raccelerate Phenomenon follows the same principle as Newton’s Third Law of Motion in that whenever there is a perceived infringement by a Black male against a White female there is an negative overreaction portrayed in the media. Specifically, the Raccelerate Phenomenon states that for every action that a Black male takes against a White female there is an elevated negative reaction towards Black men. The Raccelerate Phenomenon is the cause for many of the racial tensions between Blacks and Whites. There were several schools districts that were identified as racist because they were over disciplining Black students. At this time they remain anonymous. According to the following chart, the schools/school district would have had the following ratings according to the Raccelerate Racism Scale. After thirteen years as a math teacher, and several years as a central office administrative math and curriculum specialist, I had the opportunity to impact children as an assistant principal. Two of my primary responsibilities were instruction and discipline. After several months as an assistant principal, I realized that the amount of the discipline that I processed was unproductive for the students and the school. I conducted a thorough quantitative analysis and found that Black students were overrepresented in disciplinary infractions. Black students accounted for 45% of the processed disciplinary infractions while accounting for 33% of the student population. Hispanics, Whites, and Asians students accounted for 53%, 1%, and 1% of the processed disciplinary infractions, respectively. The administrator demographics were White (67%) and Black (33%). Instructional staff demographics were White (95%), Black (3%), and Hispanic (2%). Most students at SSHS were minorities. Student demographics were Hispanic (60%), Black (33%), White (4%), and Asian Pacific Islander (3%). Ninety-nine percent of the students qualified for reduced or free lunch. I was not totally convinced that there was a racial problem, so I conducted a cultural analysis. I found discrepancies such as administrator beliefs and teacher overemphasis of discipline. For example, several administrators believed that the parents of the students sent their children to the school to receive discipline. Others teachers believed that students needed to receive double discipline for the same infraction. Still not totally convinced, I conducted a qualitative analysis. I interviewed several teachers and students. After evaluating the transcripts and considering all of the collected data, I understood that this was a racial challenge and forged forward to help the students and the organization. After writing my dissertation, Promoting Positive Racial Teacher-Student Classroom Relationships and leaving the organization. I found out that the school received several awards after I completed the transition. In 2012, the United States Department of Education honored them with the Title 1 distinguished School of Excellence. In 2012 and 2013 US News and World Report honored them as a Bronze Medal School. In 2013, they were honored as a New Jersey School of Character – one of three high schools in the state to receive this honor. I believe that it is a disservice to students, parents, teachers, administrators, the education community, businesses, the country, and the world to continue to keep the process a secret. With that in mind, we provide professional services to all of our clients that will reduce racism in school classrooms and other professional environments. 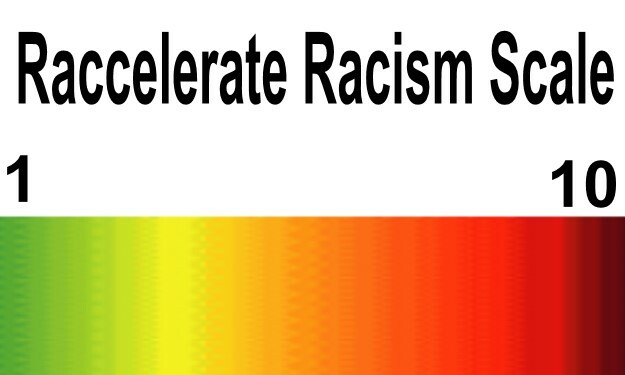 The Raccelerate Racism Formula and the Raccelerate Racism Scale has been designed to help schools and teachers to evaluate the possibility of racism in their classroom or school. Previous Previous post: Can teachers reduce classroom discipline involving Black students? Next Next post: Why hate crime charges will not be filed for the Trayvon Martin killing? work on. You’ve done an impressive task and our entire neighborhood will likely be grateful to you. weblog posts. After all I’ll be subscribing for your feed and I hope you write once more very soon! As the admin of this site is working, no uncertainty very shortly it will be well-known, due to its quality contents. I am truly delighted to read this website posts which carries plenty of helpful information, thanks for providing these kinds of information. feed to stay up to date with drawing close post. Thank you 1,000,000 and please continue the enjoyable work. That is the correct weblog for anyone who needs to find out about this topic. You understand so much its nearly hard to argue with you (not that I really would want…HaHa). You positively put a brand new spin on a topic thats been written about for years. Great stuff, simply great!